Note: Saline or METH were administered 30 min after the administration of the nNOS inhibitor. Rectal temperature was monitored for 2h after METH injection. The interval between each pair of injections was 3h. Administration of the low dose of 7-NI (25 mg/kg) did not blunt METH-induced hyperthermia after the first and second injections, but it attenuated the hyperthermia caused after the third injection of METH. The high dose of 7-NI (50 mg/kg) caused a decrease in temperature and also abolished METH-induced hyperthermia. Administration of 3-Br-7-NI or SMTC affected neither normal temperature nor METH-induced hyperthermia. (*p<0.05 compared to temperature measured at time 0). The striatal dopaminergic markers, dopamine, DOPAC, and HVA were measured by HPLC and the dopamine transporter (DAT)-binding sites by [3H]mazindol binding. METH caused a significant depletion in the dopaminergic markers (*p < 0.05 compared to control values), whereas the nNOS inhibitors 3-Br-7-NI and SMTC afford a full protection. Fig. 5. 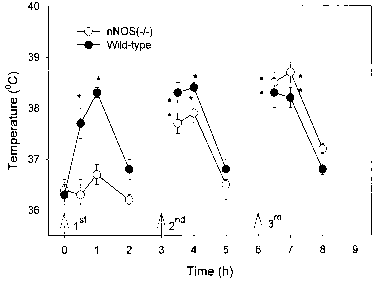 Effect of METH on rectal temperature of nNOS(-/-) and wild-type mice. Animals received 5 mg/kg METH (ip; q3h x 3). Rectal temperature was measured before METH administration (time 0) and then after 30, 60, and 120 min following each injection of METH. The first injection of METH had no significant effect on rectal temperature of the nNOS (-/-) mice, but it caused significant hyperthermia in the wild-type mice (*p < 0.05 compared to time 0). However, the second and third injections of METH caused significant hyperthermia in both the nNOS(-/-) and wild-type mice (*p < 0.05 compared to time 0). Arrows represent time of METH (5 mg/kg) injections. nNOS(-/-) mice to cocaine-induced locomotor sensitization. 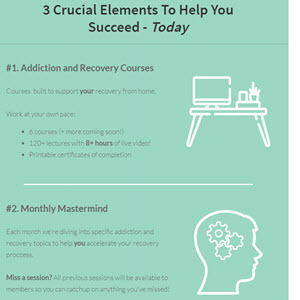 The role of nNOS in the rewarding effect of cocaine and other abused substances (e.g., alcohol and nicotine) is suggested by the following observations. (1) The nNOS inhibitor 7-NI blocked cocaine-, ethanol-,and nicotine-induced CPP. (2) 7-NI had no effect on LiCI-induced conditioned placed aversion. 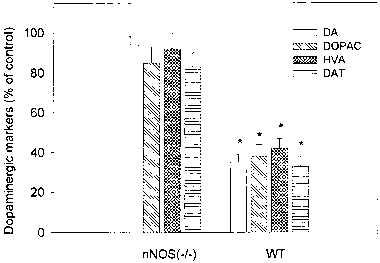 (3) nNOS(-/-) mice were resistant to cocaine-induced conditioned place preference. The involvement of nNOS in methamphetamine-induced dopaminergic neurotoxicity is supported by the findings that (1) several nNOS inhibitors such as 7-NI, 3-Br-7-NI, and SMTC attenuated the depletion of dopaminergic markers with no significant effect on METH-induced hyperthermia and (2) nNOS(-/-) were resistant to METH-induced dopamin-ergic neurotoxicity. In all the behavioral paradigms tested and in the neurochemical studies, there was a good correlation between the pharmacological blockade of nNOS and the deletion of the nNOS gene. Therefore, nNOS has an important role in mediating both the rewarding and neurotoxic effects of psychostimulants. Further studies are necessary to determine whether selective nNOS inhibitors may be useful therapeutics for the management of addiction to psychostimulants.